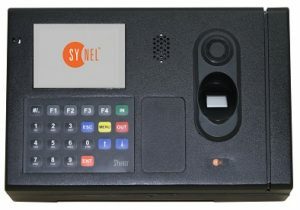 Synergy Linux-based fingerprint biometric terminal from Synel MLL PayWay LTD is now available in Metal case. In addition to the many benefits of Synergy for time recording employee’s clock-in & clock-out records, the terminal was designed for difficult work environment, such as the manufacturing area, the entrance to the mines, etc. SYnergy is Linux-based fingerprint biometric terminal, which combines a graphic color screen with technologically advanced features for all your time & attendance and access control applications. The SYnergy equipped with a built in camera and a speaker for generating various sound effects such as alert notifications, report confirmation / rejection and other actions and events indications.